For the European mini MPV, see Ford Fusion (Europe). The Ford Fusion is a four-door, five-passenger mid-size sedan manufactured and marketed by Ford. Introduced for the 2006 model year, three generations of the Fusion have been produced in gasoline, gas/electric hybrid, and gas/plug-in electric hybrid variants. The Fusion is manufactured at Ford's Hermosillo Stamping and Assembly plant in Sonora, Mexico alongside its rebadged variant the Lincoln MKZ, and formerly the Mercury Milan, both of which share its CD3 platform. Ford announced to discontinue the Fusion in April 2018. Production on the first Fusions began on August 1, 2005. The Fusion replaced the Mondeo for the Latin American markets—except in Argentina (where the current European Mondeo is available) and in the United States and Canada (where it superseded the then mid-size Taurus and the compact Contour). The Fusion is positioned between the compact Ford Focus and full-size Ford Taurus. In the Middle East, this model is sold alongside the Mondeo. Versions sold there are available only with the 2.5-liter engine. Unlike in the United States, Canada and Latin America, no V6 engine is available in that region. The same is true in South Korea, where only the 2.5-liter engines (including those for the hybrid model) are available as of the 2012 model year. The third generation line-up includes a gasoline engine option, an EcoBoost engine option, a next-generation hybrid model, and a plug-in hybrid version, the Ford Fusion Energi, making the Ford Fusion the first production sedan to offer these four options. Sales of the gasoline-powered and hybrid versions began in the U.S. in October 2012 under the 2013 model. Sales in Europe and Asia, as Ford Mondeo, are expected to begin in 2015, along with South Africa, where the Fusion name will be used. Deliveries of the Fusion Energi began in the U.S. in February 2013. The entire 2013 Ford Fusion line-up was awarded with the 2013 Green Car of the Year at the 2012 Los Angeles Auto Show. Built on the Ford CD3 platform, the Fusion was the first production car to feature the "new face of Ford" three-bar grille, which (along with two matching bars below the bumper/fascia forming a five-bar design) was first seen on a retro V10-powered rear-wheel-drive concept car called the Ford 427, unveiled in 2003 at the North American International Auto Show (NAIAS) in Detroit. At its launch, the Fusion was available in S, SE, and SEL trims. The base engine was the 160 hp (119 kW) Mazda-designed 2.3 L Duratec 23 I4, paired with either a 5-speed manual or 5-speed automatic transmission. SE and SEL models were available with a 221 hp (165 kW) 3.0 L Duratec 30 V6 and a 6-speed automatic. The Fusion shares some interior parts with the otherwise unrelated Mk III Ford Mondeo, such as part of the console and the seats. Both automatic and manual transmissions are available (the latter only with the I4 engine). Ford's early advertising campaign for the Fusion in the United States was entitled "Life in Drive", while in Canada it was "Create a Reaction". In January 2007, the company launched a new campaign for the Fusion titled "Fusion Challenge" (later renamed "Ford Challenge"). The American Ford Fusion emerged the winner over the Toyota Camry and Honda Accord based on the attributes of styling, reliability from Consumer Reports, handling, and “fun to drive” in head-to-head comparison tests with the Japanese sedans performed by subscribers of Car and Driver and Road and Track magazines in the Washington D.C. and Los Angeles regions. In July 2007, Motor Trend reported that Ford's Special Vehicle Team tuner group planned to release a Fusion GT in late 2009 or early 2010. Its 3.5-liter Eco-Boost V-6 would make about 340 horsepower. No such vehicle ever came to fruition. For 2007, all-wheel-drive became available on V6 models. Sirius Satellite Radio became available as an option on the SE and SEL models. The front passenger fold-flat seat was introduced and became standard on the Fusion SEL and SE models. Also, the Fusion gained front-seat side airbags and a side air curtain as standard features, as well as an anti-theft perimeter alarm. (All were previously available as cost options.) Also added was an auxiliary audio input jack for audio transmission from a portable audio player along with some equipment modifications. A DVD-based navigation system also became available. For the 2008 model year, ABS became a standard feature, as did a tire pressure monitoring system. New optional features include rear parking assist, Ford's "SYNC" multimedia and communication system, and ambient interior lighting. The DVD navigation was replaced with a new generation system featuring voice commands, and for the first time navigation is available also with manual transmission. Finally, 2 packages were added to the options list: Sport Appearance Package and Moon and Tune package. The latter makes the Audiophile 8-speaker audio system available on the SE trim line. Several colors were removed and some others added. For 2009, electronic stability control was added as an option. A new appearance package with blue trim became available, and revisions were made to the exterior color palette as well. The S was the base model, including the 2.3L Duratec I4 engine, automatic transmission, manual transmission, AM/FM stereo with single-disc CD player and four speakers plus an auxiliary audio input jack (2007-2009), sixteen-inch steel wheels with plastic wheel covers, cloth seating surfaces, and keyless entry. The SE was the step-up model, adding sixteen inch alloy wheels, AM/FM stereo with single-disc CD/MP3 player, power front driver's seat, and a security system. The SEL was the top-of-the-line model, seventeen inch aluminum wheels, adding power dual front seats and later offering a standard Ford SYNC system. In Mexico the Fusion was offered in two trim levels through 2005-06: SE and SEL, with automatic transmission only. For the 2007 model year, the S trim was introduced and a manual transmission was newly available for the S and SE trim levels. These two trims had standard 16-inch alloy wheels, while the SEL trim had 17-inch alloy wheels standard. The 2008 model year added Ford's Ford SYNC to the SEL trim. The manual transmission was discontinued after 2008 in Mexico due to poor sales. The 2009 model year was a very short one in Mexico because the 2010 Fusion arrived in dealerships by late February 2009. Although the frontal offset test for 2007 (later release) to 2009 is rated good overall by IIHS, injury measures from head/neck and right leg/foot is rated acceptable. For the 2010 model year, Ford significantly updated the Fusion, along with the Mercury Milan and Lincoln MKZ, with new front and rear end fascia designs and interior and powertrain revisions. Powertrain options are similar to those that debuted on the 2009 Ford Escape, including the new 2.5 L I4 and 3.0 L PIP Duratec series V6 engine coupled to Ford's new 6F35 six-speed transmission. The 3.0 L Duratec provided 240 hp (179 kW) with E85 fuel capability, while the I4 provided 175 hp (130 kW). The 3.5 L Duratec 35 producing 263 hp (196 kW) was standard in the Fusion Sport. The I4 and 3.0 L V6 engines included adaptive knock control and aggressive deceleration fuel cutoff features to improve fuel economy. 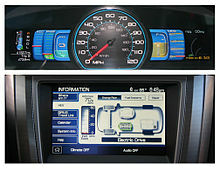 Interior changes included a new optional 8" screen navigation control system, a new center console design, and Ford's new trademark "Ice Blue" illumination for the controls and gauges that is shared with the current Ford Focus and Ford F-150. The S was once again the base model, including the 2.5L Duratec I4 engine, manual transmission, AM/FM stereo with single-disc CD/MP3 player, auxiliary input jack and four speakers, sixteen-inch alloy wheels, cloth seating surfaces, and keyless entry. The SE was the mid-range model, adding seventeen-inch steel wheels, six speakers, and power front driver's seat, as well as a security system. SIRIUS Satellite Radio also came standard on this model. The SEL was the upper-end model, with seventeen inch aluminum wheels, standard Ford SYNC system and 290 watt Sony 12 speaker surround sound, standard leather seating surfaces (optional cloth for fleet), dual zone automatic temperature control, driver door keypad, and dual power front seats. The Sport was a stand-alone model, offering standard eighteen-inch alloy wheels, darkened front grille (2011-2012), rear spoiler, lower body side skirts, leather seating surfaces, a 3.5L Duratec V6 engine, and sport tuned suspension. The Hybrid model added onto the SEL model, with a 2.5L Duratec I4 engine assisted by an Atkinson hybrid electric motor, an electroluminescent Optitron-style gauge cluster, dual power front seats, and an Eco Driving mode to tell the driver how economically they are driving. The Ford Fusion line-up was included in the Insurance Institute for Highway Safety 2010 "Top Safety Picks" rating for the mid-size category. Due to the fact that Ford modified and strengthened the roof structure of the Flex, Fusion, and MKT vehicles, these 2010 ratings apply only to Lincoln MKZs, Mercury Milan and Fusions built after April 2010. In June 2010, it is reported that National Highway Traffic Safety Administration was investigating into floormat-related unintended acceleration in 2010 Ford Fusion and Mercury Milan. According to NHTSA's estimate, as many as 249,301 cars could be affected. On May 28, 2010, the NHTSA issued a statement that the stacking of all-weather floor mats from any manufacturer on top of the factory floor mat could cause accelerator entrapment. In their press release they stated the following: "NHTSA is urging drivers of 2010 Fusions to make sure they do not stack the rubber “All Weather” floor mat on top of the secured carpeted floor mat. Further, drivers are reminded to ensure that any driver-side floor mats (whether they are the carpeted floor mat or all weather floor mat) are properly installed and restrained by the retention hooks on the floorboard. Depending on vehicle and floor mat design, it is possible for unsecured floor mats to interfere with accelerator or brake pedals in a wide range of vehicles. Therefore, NHTSA reminds all drivers of all makes and models to check the driver-side floor mats for secure installation and to follow all manufacturer instructions for installing the mats." On October 2, 2014, the NHTSA's Office of Defects Investigation opened an investigation into the Electronic Power Assisted Steering (EPAS) subsystem used in Ford Fusions, Lincoln MKZs, and Mercury Milans with model years between 2010 and 2012. The investigation was opened in response to over 500 complaints where motorists reported the sudden loss of power steering while driving. An estimated 938,000 vehicles are included in the investigation. The investigation is ongoing. On May 27, 2015, Ford issued a recall for 2011-2012 Ford Fusions, Mercury Milans, and Lincoln MKZ's made in Mexico, along with 2011-2013 Ford Taurus, Ford Flex, Lincoln MKS and Lincoln MKT's built in Chicago or Oakville. The repair involves a software update and/or steering replacement due to a malfunctioning sensor. The 2010 Ford Fusion Hybrid is a gasoline-electric hybrid powered version of the mid-size Fusion sedan launched to the U.S. market in March 2009, with an initial sale price of US$27,270. EPA ratings for the Ford Fusion Hybrid are 41 mpg city and 36 mpg highway. In city driving a full tank delivers 700 miles. In April 2009 editors of Kelley Blue Book named the 2010 Ford Fusion Hybrid to its 2009 list of "Top 10 Green Cars". The Fusion Hybrid qualified for a hybrid tax credit of US$3,400 prior to March 31, 2009. The credit dropped to US$1,700 if purchased by September 30, 2009, and to US$850 if purchased by March 31, 2010. This credit phased out on April 1, 2010. This model gets better EPA-estimated fuel economy than the Toyota Camry Hybrid, the Nissan Altima Hybrid, and the Chevrolet Malibu Hybrid, viewed as its competitors in the mid-size sedan segment. Consumer Reports in its December 6, 2012 publication found that the Ford Fusion Hybrid and Ford C-Max Hybrid's tested fuel economy was 20% (8 MPG) short of Ford's EPA mileage claims. After many reports from owners and media of the Ford Fusion Hybrid getting less than the stated 47 MPG city/47 MPG highway/47 MPG combined, a class action lawsuit was brought against Ford on December 26, 2012. Consumer Reports reviewed several other vehicle makes and models and found the Fusion Hybrid from Ford were the worst under-performers compared to EPA fuel efficiency ratings in real world usage compared to 16 others including hybrids. The second generation Fusion was unveiled at the 2012 North American International Auto Show as a 2013 model. The redesigned Fusion is built on the Ford CD4 platform and is an example of Ford's global car strategy "One-Ford", with design led by Ford of Europe, started with the Focus and then the extension of Fiesta production, which both came into North America in 2012. The new model marks the re-convergence of Ford's mid-size platform for both Europe and the Americas - the CDW27 program which spawned the Ford Contour/Mercury Mystique and the original European Mondeo had been the company's previous attempt at a mid-size car for the world, which was met with mixed success. As a One-Ford project, Ford of Europe Head of Advanced design team Chris Hamilton was commissioned as lead designer based in Detroit, under the guise Exterior Chief Designer for Ford/Lincoln, with design support led from Ford of Europe studios in Germany and the United Kingdom. Test and development of localized versions was undertaken in both North America and Europe, resulting in different engine choices, automatic gearboxes, suspension settings and tires. Like the previous generation Fusion, the final assembly takes place at Hermosillo Stamping and Assembly, Hermosillo, Sonora, Mexico. Due to strong sales of the redesigned 2013 year model, additional capacity was added in Flat Rock Assembly Plant, Michigan. The hybrid version and the Fusion Energi plug-in hybrid will continue to be assembled in Mexico. The Mexican assembly plant won the prized MIT, Worlds Best Automobile Plant award. In Europe and other international markets, the engine range is similar, but the 2.5 will only be available in North America. In international markets, a three-cylinder 1.0L 123 bhp EcoBoost, claimed to produce just 125g/km of CO2 emissions; and the Ford Fusion Energi plug-in hybrid is expected to be released between 2014 and 2015. The second generation Fusion was built with a 122 mm (4.8 in) longer wheelbase than the outgoing model's CD3 platform, is 28 mm (1.1 in) bigger overall, 18 mm (0.7 in) wider, and 31 mm (1.2 in) taller. In contrast to the front double wishbone suspension of the first generation Fusion, at front are MacPherson struts, and at rear is a multi-link rear suspension. Despite larger exterior dimensions, some aspects of the interior have shrunk, including the trunk, which fell slightly from 467 to 453 L (16.5 to 16.0 cu ft). The 2013 Fusion is available in S, SE, and Titanium trim levels. Ford assembled five different powertrains for the second generation, including two hybrid variants. All available engines are four-cylinder offerings, dropping the previous model's 3.0L V6 as the top tier engine choice, as part of Ford's push to phase out the aging Duratec 30, as well as the Sport package's 3.5L V6 as a performance option. In the 2017 update, the Sport model returned, powered by a 2.7L turbocharged V6. The second generation Fusion introduced several driver assistance technologies based on sensors, cameras and radar. Safety features include Lane Keeping System; adjust vehicle speed to changing traffic conditions through adaptive cruise control with Forward Collision Warning; active park assist paired with a backup camera; and Blind Spot Information System (BLIS) with cross-traffic alert, which consists of sensors in both rear quarter-panels that are able to detect traffic in a driver’s blind spot, providing both audible and visual warnings if traffic unseen by the driver is detected. BLIS technology enables rear cross-traffic alert, aiding drivers backing out of parking space where visibility is obstructed. Other safety features include Ford Sync, second-row Inflatable Safety Belts, Auto Start-Stop, electric power-assisted steering, and Intelligent All-Wheel Drive. For the 2014 model year the chief improvement was a new 1.5-liter four-cylinder engine option. S The base model, offering a 2.5L Duratec I4 engine, automatic transmission, an AM/FM color screen stereo with single-disc CD/MP3 player, and USB, Bluetooth connection, auxiliary input jacks and SIRIUS Satellite Radio, the Ford SYNC System, four speakers, reverse camera with motion activated guidelines, cloth seating surfaces, sixteen-inch steel wheels with plastic wheel covers, chrome door handles, and keyless entry with a switchblade-style key. SE Adds six speakers, seventeen-inch alloy wheels, and a power front driver's seat. Titanium (replacing the SEL) Adds synthetic leather seating surfaces, heated front seats, dual power front seats, the MyFord Touch System with an A/M-F/M HD Radio radio, a single-disc CD/MP3 player, SD card slot, USB, A/V, and auxiliary input jacks, push-button start, keyless access, a Sony 390-watt premium surround sound system, and eighteen-inch alloy wheels. Hybrid Is offered in the same three trims but for 2017, it is offered in four trims S, SE, Titanium, and Platinum. Sport Available starting from the 2017 model year, the inline-4 is replaced by the 2.7 Ecoboost 325-hp V6 engine, adds a black mesh grille, 19-inch wheels, a decklid spoiler, quad exhaust pipes, and standard All Wheel Drive. Platinum Added to the Ford Fusion family for the 2017 model year and has lots of standard features like Power Moonroof, Universal Garage Opener, Fancy Sport Chrome Mesh Grille, Nappa Leather Seating Surfaces, and Heated and Cooled Front Seats. Energi A Plug-in Hybrid Version of the Fusion offered in two trims SE and Titanium until 2017. The Ford Fusion Platinum Energi was added to the Fusion Energi family for 2017. The new 2013 line-up also includes a next-generation hybrid version, and a plug-in hybrid version, the Ford Fusion Energi. The Ford Fusion became the first production sedan to offer these three options. Sales of the gasoline-powered and hybrid version began in the US in October 2012. Sales in Europe and Asia, as Ford Mondeo, are expected to begin in 2013. Deliveries of the Fusion Energi began the U.S. in February 2013. Sales of the Mondeo line-up, including the hybrid model, began in Germany in August 2014. For the second generation Fusion Hybrid the nickel-metal hydride batteries used in the hybrid first generation were replaced with lithium-ion batteries. The 2013 model year is more fuel efficient than its predecessor, with a US Environmental Protection Agency (EPA) rating of 47 mpg‑US (5.0 L/100 km; 56 mpg‑imp) with the same rating for combined/city/highway cycles. This rating is also the same Ford achieved for the 2013 Ford C-Max Hybrid, as both hybrids share the same engine and drivetrain. These ratings allowed the 2013 Fusion Hybrid to outperform the 2012 Toyota Camry Hybrid LE by 4 mpg‑US (0,5 L/100 km; 4.8 mpg‑imp) city and 8 mpg‑US (1 L/100 km; 9.6 mpg‑imp) highway, and to become the most efficient midsize hybrid sedan in the U.S. as of September 2012. The Duratec 2.5, and EcoBoost 1.5, 1.6 and 2.0 are sourced from Chihuahua, Mexico; Craiova, Romania; Bridgend, Wales; and Valencia, Spain respectively. The 6F and HF35 automatic transmissions are sourced from Ford's Van Dyke Transmission Plant in Sterling Heights, Michigan, while the B6 manual is produced at the GETRAG FORD Transmissions GmbH facility in Halewood, United Kingdom. Ford updated the Fusion for the 2017 model year. The facelifted version was first unveiled at the 2016 North American International Auto Show on January 11, 2016. All Fusions received new packages, new front and rear end styling, a new rotary-controlled automatic transmission, and two new trim levels of the gasoline-powered Fusion: the high-performance Sport, which marks the first time that a V6 engine has been installed into a second-generation Fusion, and the Platinum, which adds more luxury features onto the previously top-of-the-line Titanium trim level (the Platinum is also available for both the Fusion Hybrid and Fusion Energi models). Also new for 2017 on most Fusion models is Ford's new SYNC 3 infotainment system with Android Auto and Apple CarPlay compatibility, which replaces the MyFord Touch infotainment system that was offered on the 2016 Fusion. Pricing starts at $22,120 for a base gas-powered Fusion S model with the 2.5 L Duratec I4 engine, and tops out at $39,120 for a top-of-the-line Fusion Energi Platinum model with a 2.0 L I4 engine and an Atkinson Cycle electric motor with EV Mode. Ford again updated the Fusion for the 2019 model year. This version debuted at the 2018 New York International Auto Show, and will go on sale in late summer 2018. The 2019 Fusion adds Ford's "Co-Pilot 360" safety suite as standard on all models. It includes automatic emergency braking, lane-keeping assist, blind-spot and rear-cross-traffic warning systems, automatic highbeams, and automatic wipers. The new models have updated front and rear styling. The 1.5 L EcoBoost engine is now standard on SE and higher models, except for the V6 Sport, formerly known as Sport. The SEL replaces the SE Luxury Package, and the Platinum is dropped, moving the Titanium up-level. The Hybrid is no longer available in base S trim, and the Energi is available only in Titanium trim. The Energi model's battery range will increase from 22 miles to 25 miles, and the battery may take less space in the trunk. In 2012, Ford recalled about 90,000 2013 Ford Escape and Fusion in the U.S. and Canada with 1.6-liter engines that may overheat and cause fires after 13 reports of fire were reported to Ford. In 2017, Ford recalled 2013-2014 Ford Fusion with 1.6 ecoboost engines because of a risk of engine fires caused by a “lack of coolant circulation”. The recall partly contributed to a charge of US$300 million by Ford. In 2018, Ford recalled 2013-15 Ford Fusion with 1.6-liter Sigma GTDI engines and B6 manual transmissions, due to potential risk of the steering wheel becoming loose. Ford initially planned to discontinue the Fusion along with its other sedans in North America in the next few years, as part of a plan to focus more on SUVs and trucks. The Fusion is expected to be the last sedan sold by Ford (Lincoln notwithstanding), with the Ford Taurus and Ford Fiesta being dropped in North America in early 2019; the Fusion will also be the last traditional car aside from the Ford Mustang offered by the Ford division. However, a report by Bloomberg News in July 2018, citing an unnamed Ford source, is stating that Ford is reconsidering dropping the Fusion name due to strong brand equity in the name as well as dealer protests. While the sedan will still be dropped, the reports now state that the Fusion will live on as a Subaru Outback-like crossover wagon likely called the Fusion Active and based on the current Fusion's Ford CD4 platform. The Fusion's transformation would be similar to that of the Buick Regal, which in 2018 went from being a sedan to a wagon and fastback-styled hatchback. Ford itself would not comment on the Fusion's future. On September 5, 2018, Ford ended all national and promotional advertising (including sales and special offers) for its entire sedan lineup, including the Fusion, whose production will continue despite its possible discontinuation. Ford has confirmed the Fusion will live on through at least the 2020 model year in North America. The 2013 NASCAR Sprint Cup Series Generation 6 version of the Ford Fusion as driven by Ricky Stenhouse Jr. at Martinsville Speedway. The Fusion also became the new body style for Ford automobiles in NASCAR beginning in 2006, replacing the Taurus. This marked the first time since the Torino in 1968 that Ford introduced a new model that went racing in NASCAR at the same time as its launch. For the introduction of the Generation 6 body design in 2013, the vehicles were updated to match the second generation Fusion. The Generation 6 body styles were also meant to closer resemble the production versions of their respective vehicles. On April 17, 2018, Ford announced that the Mustang will replace the Fusion in the 2019 Monster Energy NASCAR Cup Series season. Ford announced its attempt to use a fuel cell version of the Fusion, Ford Fusion Hydrogen 999, to set a land speed record on August 10–17 during Bonneville Speed Week in 2007. The Fusion 999 project was born in early 2006 when Ford fuel cell engineering manager Mujeeb Ijaz approached Roush Racing about a project to demonstrate the performance potential of a fuel cell-powered vehicle. Roush's team, led by Rick Darling, worked with a team of Ford engineers and technicians led by Matt Zuehlk to come up with a vehicle design that could meet the goal of exceeding 200 mph (320 km/h) on the Bonneville Salt Flats, fueled only by hydrogen. On August 15, 2007, the vehicle set the fastest fuel cell ground vehicle speed record of 207.297 mph (333.612 km/h). The car was driven by retired Ford engineer Rick Byrnes, a long time Bonneville racer. 2010 Motor Trend Car of the Year trophy won by the Ford Fusion line-up exhibited at the 2010 Washington Auto Show. In July 2006, Strategic Vision gave the Fusion its Total Quality Award as the best-quality midsize sedan on the American market. In March 2006, the International Carwash Association named the Fusion America's "Most Washable Car." In November 2009, the 2010 Ford Fusion line-up was selected as the 2010 Motor Trend Car of the Year, beating a field of nearly two dozen contenders. In December 2009, Car and Driver magazine listed the 2010 Fusion Hybrid as one of the "10 Best Cars". The piece stated that the Fusion Hybrid was the most advanced of all the cars they tested. In January 2010, the Fusion Hybrid won the 2010 North American Car of the Year Award at the Detroit Auto Show, and was named "Best of 2010" by Cars.com. In November 2012, the 2013 Ford Fusion (second generation) line-up, including the gasoline and EcoBoost engine options, and the Fusion hybrid and plug-in variants, won the 2013 Green Car of the Year awarded by the Green Car Journal at the Los Angeles Auto Show. In 2017, the Ford Fusion was awarded the MotorWeek Drivers' Choice Award for Best Family Sedan. Consumer Reports has also given positive reviews to the Fusion, as it had to the previous Taurus. It rated the Fusion Hybrid the top domestic sedan for 2010. In 2009, the magazine's automotive editor, Rik Paul, said, "The Ford cars outscored Honda's Accord and Toyota's Camry, the two top-selling cars in America, 'which many people view as the paradigms of reliability'," referring to the Fusion and Mercury Milan. In the January 2009 issue, Motor Trend rated the Fusion Hybrid ahead of the Toyota Camry Hybrid. and in the February 2009 issue rated the Fusion Hybrid ahead of the Toyota Camry Hybrid, the Nissan Altima Hybrid, and the Chevrolet Malibu Hybrid. In a 2012 comparison test by Motor Trend, the Ford Fusion came in third place out of six cars behind the first place Volkswagen Passat and second place Honda Accord. According to Ford, consumer response to the 2006 Fusion had exceeded their expectations, with 30,000 sold during the first quarter of 2006. By October 2009, the Fusion became one of the top ten best-selling cars in the U.S. for the first time, as well as the best-selling car by a domestic automaker. Ford also sells the Fusion in Mexico and Brazil. In Brazil, it became the highest-selling car in its class in 2008. ^ a b Binder, Alan K., ed. (2006). Ward's Automotive Yearbook 2006. Ward's Communications, Inc. p. 102. ^ "Business Week June 13, 2005". Business Week. June 13, 2005. Archived from the original on September 4, 2011. Retrieved January 10, 2012. ^ "Environmental Protection Agency Fuel Economy". FuelEconomy.com. US Department of Energy. Retrieved November 18, 2007. ^ "Ultimate Car Buyer Guide". DriveArabia.com. Archived from the original on September 23, 2010. Retrieved June 1, 2010. ^ "New York Auto Show 2003 Highlights - Ford Futura". cardesignnews.com. Archived from the original on 2007-08-07. ^ a b c Newbury, Stephen. The Car Design Yearbook 4. Merrell. ^ "Ford working on high-performance Fusion GT, EcoBoost 'Stang on hold". Autoblog. July 7, 2008. ^ a b "IIHS-HLDI: Ford Fusion". Iihs.org. February 5, 2007. Retrieved October 19, 2010. ^ "IIHS-HLDI: Ford Fusion". Iihs.org. August 12, 2010. Retrieved October 19, 2010. ^ "IIHS-HLDI: Ford Fusion". Iihs.org. March 5, 2006. Retrieved October 19, 2010. ^ "IIHS-HLDI: Ford Fusion". Iihs.org. February 5, 2007. Retrieved October 19, 2010. ^ "Roof strength evaluations: Midsize moderately priced cars". Iihs.org. Archived from the original on October 25, 2012. Retrieved October 19, 2010. ^ "Iniciará producción de Fusión híbrido en Ford Hermosillo - ALVOLANTE.INFO". alvolante.info. ^ "2010 Ford Fusion Review". Edmunds.com. ^ "Ford rolls on its 'Way Forward' turnaround". USA Today. May 12, 2008. Retrieved May 12, 2008. ^ "Ford adds power to Fusion". Detroit News. April 21, 2008. Retrieved May 12, 2008. ^ "Tech Analysis: 2010 Ford Fusion/Mercury Milan powertrains, 38 mpg hybrid!". AutoblogGreen. October 30, 2008. ^ "2010 Ford Fusion packs a fuel-efficient punch with new gas engine, six-speed transmission lineup". Media.Ford.com. October 29, 2008. Archived from the original on December 1, 2008. ^ "2011 Ford Fusion – Specifications". Ford Vehicles. Retrieved June 20, 2009. ^ "New Ford hybrid system expected to deliver class-leading fuel economy, improved drivability". Media.Ford.com. October 29, 2008. Archived from the original on December 2, 2008. ^ a b "TOP SAFETY PICKs 2010". Insurance Institute for Highway Safety. Retrieved June 12, 2010. ^ "IIHS chooses 9 more Top Safety Picks". Consumer Reports. June 9, 2010. Archived from the original on June 12, 2010. Retrieved June 12, 2010. ^ "Ford Fusion faces probe over gas pedal getting caught under floor mat". USA Today. June 1, 2010. Retrieved June 2, 2010. ^ Piscitelli, Julia (28 May 2010). "Consumer Advisory: Owners of MY 2010 Ford Fusion and Mercury Milan Warned of Possible Stuck Accelerator Pedals" (Press release). National Highway Traffic Safety Administration. Retrieved 19 April 2013. ^ "ODI Resume" (PDF). National Highway Traffic Safety Administration. Archived from the original (PDF) on 11 April 2015. Retrieved 5 April 2015. ^ "Ford Issues Two Safety Recalls in North America" (Press release). Ford Motor Company. May 27, 2015. Retrieved May 30, 2015. ^ West, Ted. "2010 Ford Fusion 4dr Sdn S FWD". The New York Times. Retrieved June 6, 2009. ^ "Two Ford Vehicles Make KBB's Top 10 Green Cars List". New York Times. April 22, 2009. Retrieved June 6, 2009. ^ "2010 Fusion and 2009 Escape Hybrids Provide Buyers Top Tax Credits". Ford Motor Company. January 28, 2009. Archived from the original on August 18, 2009. Retrieved June 6, 2009. ^ Blanco, Sebastian (26 December 2012). "Ford dealt class-action lawsuit over C-Max, Fusion hybrid mileage claims". Autoblog. Retrieved 19 April 2013. ^ McCune, Richard D.; Kusel, Elaine S.; Kim, Jae (Eddie) K. (7 December 2012). "Class Action Complaint" (PDF). Pitkin v. Ford Motor Company. United States District Court, Eastern District of California: MPGFraud.com. Retrieved 19 April 2013. ^ "Tests show Ford Fusion, C-Max hybrids don't live up to 47-mpg claims". Consumer Reports. Consumers Union. 6 December 2012. Archived from the original on 2013-04-14. Retrieved 19 April 2013. ^ Goods, IDRAW Creative. "IDRAW Features: Next up, Dillon Blanski - Exterior Designer at Ford Motor Company". ^ "Sales figures" (PDF). media.ford.com. 2013. ^ a b Rendell, Julian (6 September 2012). "2013 Ford Mondeo - full details revealed, updated gallery". AutoCar. Retrieved 6 September 2012. ^ Tyrel Linkhorn (August 30, 2013). "Ford building a best seller in Flat Rock". Toledo Blade. Retrieved September 8, 2013. ^ Treviño, Joseph (23 September 2012). "Mexico auto production rates with world's best". Arizona Daily Star. Retrieved 19 April 2013. ^ Ford Motor Company (9 January 2012). "Ford introduces new Fusion midsize sedan with new hybrid and Energi plug-in hybrid versions" (Press release). Green Car Congress. Retrieved January 9, 2012. ^ Stenquist, Paul (29 December 2011). "New Ford Fusion Will Warn Drivers Who Drift". The New York Times. Retrieved January 9, 2012. ^ "2013 Fusion". Ford Motor Company. Retrieved June 10, 2012. ^ "Ford C-MAX Hybrid Outsells Toyota Prius v in First Full Sales Month, Helps Ford Set Hybrid, Small Vehicle Sales Records". Ford Motor Company. November 2, 2012. Archived from the original on November 4, 2012. Retrieved November 18, 2012. ^ a b Jensen, Christopher (January 9, 2012). "Ford Adds Plug-In Hybrid to Fusion Arsenal". The New York Times. Retrieved January 9, 2012. ^ Sears, Jesse (February 27, 2013). "2013 Ford Fusion Energi: Fuel Economy, Pricing and Release Date". Cars Direct. Archived from the original on March 5, 2013. Retrieved March 3, 2013. ^ Cole, Jay (March 3, 2013). "February 2013 Plug-In Electric Vehicle Sales Report Card". Inside EVs. Archived from the original on March 4, 2013. Retrieved March 4, 2013. ^ Staff (2014-08-08). "First Order für den neuen Ford Mondeo" [First Order for the new Ford Mondeo]. KFZ-betrieb (in German). Retrieved 2014-08-09. ^ Gordon-Bloomfield, Nikki (18 September 2012). "2013 Ford Fusion Hybrid Gets EPA-Approved 47MPG All-Round". Green Car Reports. Retrieved September 18, 2012. ^ "2019 Ford Fusion has more standard features and fresh styling". ^ "Sleeker, Smarter 2019 Fusion Is First Ford with Standard Ford Co-Pilot360 Driver-Assist Technology, Greater Plug-In Hybrid Range - Ford Media Center". media.ford.com. ^ "2019 Ford Fusion Energi plug-in hybrid gets 25 miles from revised battery". ^ "Ford recalls 2013 Escape, Fusion: Potential fires in 89,000 cars with 1.6-liter engine". Autoweek. Retrieved 1 April 2017. ^ "Ford recalls nearly 1.4 million cars, steering wheel can come loose". ^ Chappell, Bill (April 26, 2018). "Ford To Phase Out 'Traditional Ford Sedans' Such As Fusion And Taurus In The U.S." National Public Radio. Retrieved April 26, 2018. ^ "The Ford Fusion may live on". ^ "Report: Ford Fusion to Live On as a Subaru Outback Fighter". ^ "Ford Racing: Ford Unveils New Face For The Chase". Fordracing.com. Archived from the original on September 29, 2007. Retrieved November 18, 2007. ^ Fryer, Jenna (28 February 2007). "NASCAR may move COT to full schedule in 2008". Associated Press. Archived from the original on March 8, 2007. Retrieved March 1, 2007. ^ "Ford debuts Fusion NASCAR racer that edges closer to stock [w/video]". Autoblog. AOL. Retrieved 15 February 2017. ^ "NASCAR switches to uncommon look". Florida Times-Union. Retrieved 15 February 2017. ^ "Ford Mustang planned for Monster Energy Series in 2019". NASCAR.com. April 17, 2018. Retrieved September 15, 2018. ^ Silvestro, Brian (April 17, 2018). "Ford Will Replace the Fusion With the Mustang in NASCAR". Road & Track. Retrieved September 15, 2018. ^ "Ford Fusion Hydrogen 999 Racer To Attempt Speed Record For Fuel Cell-Powered Vehicle". Archived from the original on October 29, 2007. Retrieved November 18, 2007. ^ "AutblogGreen: Ford's Hydrogen Fusion 999 Hits The Track For The First Time". Retrieved November 18, 2007. ^ "AutoblogGreen: Ford Hydrogen Fusion 999 runs 207.3 MPH at Bonneville". Retrieved November 18, 2007. ^ "Strategic Vision: The 2006 Total Quality Award Winners". Archived from the original on January 8, 2008. Retrieved November 18, 2007. ^ "The Auto Channel: 2006 Ford Fusion Chosen International Carwash Association's Most Washable Car". Retrieved May 31, 2009. ^ Stone, Matt (November 17, 2009). "2010 Motor Trend Car of the Year: Ford Fusion". Motor Trend. Retrieved December 10, 2009. ^ "2010 Ford Fusion Hybrid – 10Best Cars". Car and Driver. November 2009. Archived from the original on November 27, 2009. Retrieved December 10, 2009. ^ "Detroit 2010: Ford sweeps NA Car and Truck of the Year". Autoblog.com. ^ "Ford Fusion Hybrid Named 'Best of 2010' by Cars.com". Theautochannel.com. September 13, 2010. Retrieved October 19, 2010. ^ Blanco, Sebastian (29 November 2012). "Ford Fusion wins 2013 Green Car Of The Year". Autoblog. Retrieved November 29, 2012. ^ "2017 Drivers' Choice Awards". Retrieved April 29, 2017. ^ Bedard, Patrick (December 2005). "2006 Ford Fusion vs. Honda Accord, Hyundai Sonata, Toyota Camry – Comparison Tests". Car and Driver. Retrieved November 18, 2007. ^ Aston, Adam (August 25, 2009). "Review: 2010 Ford Fusion Hybrid/Mercury Milan Hybrid". BusinessWeek. Archived from the original on August 31, 2009. Retrieved October 3, 2009. ^ "Consumer Reports: Ford Is "World Class"". CBS News. October 27, 2009. Retrieved March 12, 2011. ^ "2006 APEAL Study". JD Power and Associates. June 28, 2006. Retrieved October 3, 2009. ^ "2010 Ford Fusion Hybrid vs 2009 Toyota Camry Hybrid – Comparison". Motor Trend. Car and Driver. January 2009. Retrieved October 19, 2010. ^ Bedard, Patrick (February 2009). "2010 Ford Fusion Hybrid vs. Camry Hybrid, Altima Hybrid, and Malibu Hybrid". Car and Driver. ^ "Comparison: 2012-2013 Midsize Sedan, Battle of the Best-Sellers". Motor Trend. ^ Reuters (January 5, 2006). "GM U.S. Sales Fell 10.3% in Dec". Fox News. Retrieved November 18, 2007. ^ Shunk, Chris (November 12, 2009). "Ford Fusion breaks into top 10 best-selling vehicles amid best year ever". Autoblog. Retrieved November 24, 2009. ^ "2007 – MY Registrations". Automotive Fleet. March 2008. Retrieved July 16, 2008. ^ Thomas, Mike (January 8, 2006). "Ford, Lincoln and Mercury See Rising Resale Values". Ford Media. Archived from the original on January 7, 2008. Retrieved November 18, 2007. ^ Roth, Dan (January 17, 2008). "Ford Edge Headed to Brazil". Autoblog. Retrieved October 3, 2009. ^ a b c d e f g h Timothy Cain (October 2, 2013). "Ford Fusion Sales Figures". Good Car Bad Car. Retrieved October 6, 2013. ^ "December 2009 Dashboard: Year-End Tally". HybridCars. January 20, 2010. Archived from the original on January 22, 2010. Retrieved August 31, 2013. ^ "December 2010 Dashboard: Year End Tally". HybridCars.com. January 7, 2011. Retrieved August 31, 2013. ^ "December 2011 Dashboard: Sales Still Climbing". HybridCARS.com. January 9, 2012. Archived from the original on 2012-01-12. Retrieved August 31, 2013. ^ Timmins, Ben (3 January 2013). "Ford Motor Company Posts 2,250,165 Sales in 2012; Focus, F-Series Post Big Gains". Motor Trend. Source Interlink Media. Retrieved 19 April 2013. ^ Jeff Cobb (January 8, 2013). "December 2012 Dashboard". HybridCars.com and Baum & Associates. Retrieved August 31, 2013. ^ "Sales figures" (PDF). media.ford.com. 2014. ^ "December 2014 Dashboard - HybridCars.com". HybridCars.com. ^ "Sales figures" (PDF). media.ford.com. 2016. ^ "December 2015 Dashboard - HybridCars.com". HybridCars.com. ^ "Sales figures" (PDF). media.ford.com. 2017. ^ "December 2016 Dashboard - HybridCars.com". HybridCars.com. ^ "Sales figures" (PDF). media.ford.com. 2018. ^ "December 2017 Dashboard - HybridCars.com". HybridCars.com. ^ "Ford F-Series Marks 42 Straight Years as America's Best-Selling Pickup, Topping 900,000 Sold in 2018; Ford Hits Nine Straight Years as America's Best-Selling Brand; Lincoln SUV Sales Up" (PDF) (Press release). Dearborn, MI. January 3, 2019. Wikimedia Commons has media related to Ford Fusion (Americas).